Club Penguin Cheats by Mimo777 Club Penguin Cheats by Mimo777: Club Penguin Weekly Field Op Number 9 Cheat! Step 6. Go to the Stadium. Step 7. Go up to the cash register. Your spy gadget light will turn green. Awesome. The puzzle worked better for me this time cause I got my computer cleaned out not too long ago so the puzzle didn't act up as much and I did it in one shot. Good luck to everyone! Yea, sometimes I don't know that a Field Op is out and I normally find out from Mimo's sight. What would we do without Mimo's Club Penguin cheats? Yea, the reason penguins are saying it's hard is because that Field Op is normally slow on alot of computers. I had that same problem the last time I did that one, but I got my computer fixed up a little and it worked better for me this time. Oh, and also, don't forget the Pizza Parlor. There's a cash register there too. Cool. Did you have fun? I always love Birthday sleepovers. Happy late Birthday! Your present is... Hmm, here we go! A green bouncy ball! Have one of your friends bounce it around and the others will have to find it. I made that game up now! Pretty good, huh? Yea, I like challenging Field Ops. I wonder what they're going to do to the Field Ops this month. 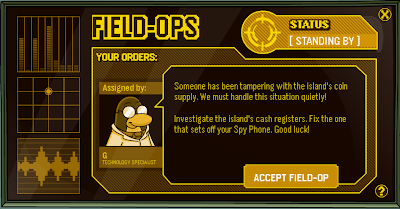 They said they were going to add stuff to the EPF Spy Phone. Can't wait to see. IT wont even load completely- i went on a one bar server and it didnt even work.... why really populated club penguin why????? yes i got it!!! thanks sasquatch server!!!!! Happy birthday! Did you have a good trip? Thanks Mimo! You make Club Penguin so much easier. I finally got the Alpha Pumps! Before that I got the Alpha Wig, and next, I'm gonna get the Alpha Suit thingy! 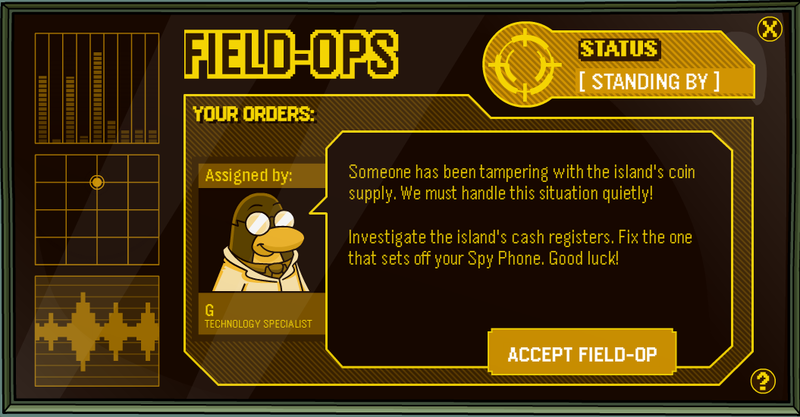 But when I went to do the Field-op this morning I had no idea where the cash register was, since you hadn't posted this yet. First I searched the gift shop. 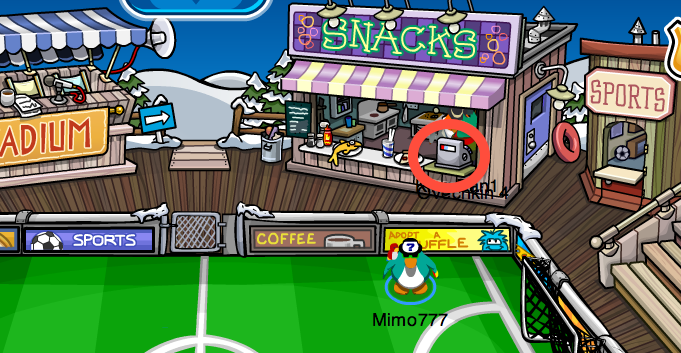 Then I checked the coffee shop, which doesn't have a cash register! Then I found the field-op at long last! I am nearly to the 99 stamp mark, but I need some major help in Catchin Waves. Does anybody know how to get the 5,000 point combo for shooting the tube? :) Thanks! Cool! I just did a two day camp out with my church! We did rafting and rock climbing and repelling. I love repelling. My dad knows how to set it up so I get to do it over the course of the year. Its really awesome. Just keep trying it. Do tricks while in the wave and bring your red puffle to get some extra points. hey mimo! the medal u get in the newest mission from the psa is a maze! its really fun! I've found that doing a trick while shooting the tube gets you points way faster. Thats how I got that stamp. But the wave catches up to you really fast when you get closer to 5,000 points. I actually crashed by accident and I ended up getting the stamp. lol, but try that. Yeah, thanks! I had no idea it was coming out already! I'm like, "Field Ops number 9 already?! I can't believe it! But I better because I have to mod the comment for it..."
And more fun! I like the game this week! But last time it took FOREVER! I did it in one shot too! But my computer didn't get cleaned out... I was just naturally bad the first time. Lol. I don't have anything! LOL! I just do the Field Ops. I don't even know what I'm saving up for! I forgot! Happy Birthday! Late, at least... You get a magical black square falling from the heavens named ???! Hooray! That's weird! Try clearing your cache! They always say to do that. Yippee! Thank you sasquatch! Now please- DON'T EAT ME! I'm afraid of Sasquatches eating me! a U r on ur 99th! Yea im not great at catching waves so i'll tell you if i figure it out and again u r on ur 99th! lol! Thanks for all your awesome tips! I will sure use them! You are all so nice! Thank you! No true point to tell you the truth, my brother is a member, he just skips them every week though. And since when is there not a good post? :E That's my vampire smiley! Same Bob, lol, don't really plan on it! Did you clear your cache? That always seems to work for me! Im trying so hard to be a mod on the lists, I've been trying for almost 4 months, probably more, yeah almost 6 I think. To become a Mod you just have to answer questions in comments for Mimo. Copy and Paste the comment to the comment box, divide the comment with lines, and start commenting back to it. After your done put your name and (CPG MOD) next to it. If you work hard and long enough Mimo will make you a Club Penguin Gang Mod. If you have anymore questions you can always go to the right side of Mimo's blog to the section where it says Be A Club Penguin Gang Mod! Good luck! P.S. I'm gonna try the mountain expedition myself before looking at your cheats! Are you sure those medals arent listed under "Total medals earned"? I think that's probably the problem. Its not your total, but how much you have earned from field ops. Its hard for me cuz of my arrow keys. If I go left it takes me right. Annoying lol! Well, What I suggest is to use a silver surf baord. You can get this buy going to the surf board catalog, and Clicking the "U" I belive. If this doesn't work, try every letter. 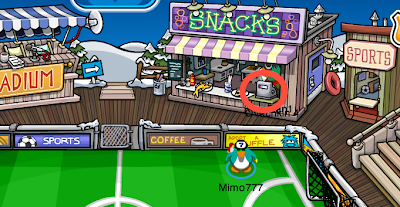 When, you bought this click on your penguin and go to items, and wear the board. Then, go and play survivial. Play for a while, untill the icebergs aren't coming. Start to shoot the toob. You can't use free style because there isn't enough time. Becareful, the wave goes by faster in survial. Well shooting the toob, do some tricks like A+S or W+S or A+D. This will help alot. When you have made it to 5000, go up and lose a board. This should get the pin. If, you need any further help don't be afraid to ask. I cannot beat it. When I hit the left key it goes all the way over to the left, and when I hit the right key it goes all the way to the right. I can't hardly keep it in the middle ones.